Insects belong to the phylum Arthropoda, which includes crustaceans such as shrimp, crabs, and pillbugs; chelicerates such as spiders, mites, and scorpions; millipedes; centipedes; and six-legged invertebrates known as hexapods. The mayfly has a brief and intense life. 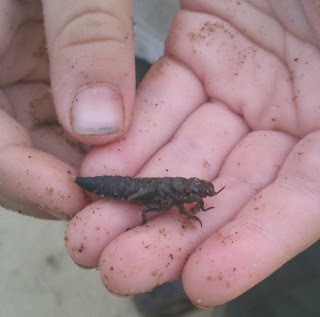 It lives for only one day in the summer (usually May), but this one day of life has tremendous impacts in a creek ecosystem. 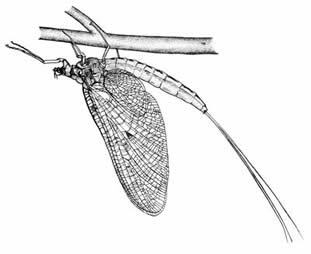 The mayfly adult lay eggs in or near water. Young mayflies,, known as "naiads", must live either in or near water. Since naiads are especially pollution-sensitive in this aquatic stage, their presence in a creek or stream is a useful bioindicator of high water quality. The mayfly feeds on decaying matter or algae. As the order name suggests, mayflies are ephemeral or very short-lived, adults living only a few hours to a few days. Mayflies are delicate-looking insects with seemingly transparent wings. When mating, they swarm, thus providing fishermen with a signal that fishing in the area will be productive. 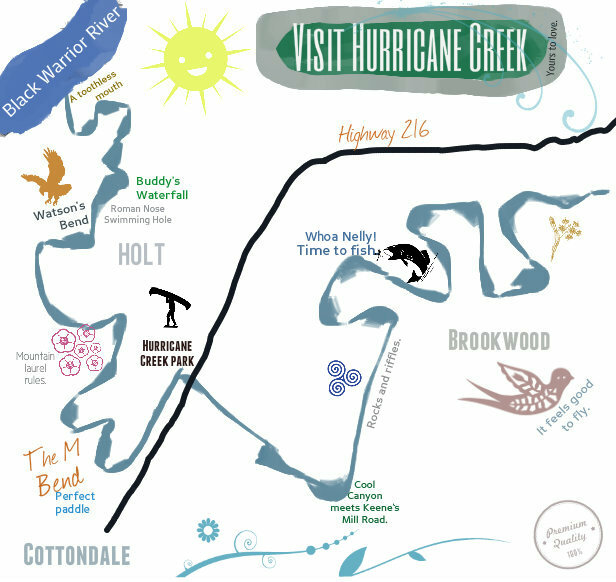 Learn about the many different kinds of mayflies identified in Alabama and see which ones can be found in the Hurricane Creek area. The EPA also has a page devoted to local mayfly diversity. Robert Witt explains why "mayflies means fine fishing" to Tuscaloosa fishermen. As members of the Order Odonata, dragonflies are known to be ancient insects. Most of a dragonfly's life is spent in the larval stage where it molts from six to fifteen times. Depending on altitude and latitude, larval development varies from the common one or two years to as many as six years. At that time, the nymph crawls up out of the water and molts one last time, emerging from its old skin as an adult with functional wings. Dragonflies do not have an intermediate pupal stage before becoming an adult. Because of this, Odonata are said to be hemimetabolous, or undergo an "incomplete" or "gradual" metamorphosis. 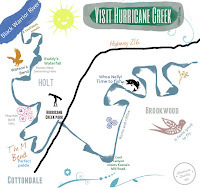 As you can see from the photo, dragonflies have been known to party at the Hurricane Creek Annual Cleanup. Mud dauber (sometimes called "dirt dauber," "dirt digger," "dirt dobber," "dirt diver", or "mud wasp") is a name commonly applied to a number of wasps from either the family Sphecidae or Crabronidae that build their nests from mud. The name of this wasp group comes from the nests that are made by the females, which consist of mud molded into place by the wasp's mandibles. You can identify the type of mud dauber from its nest. In this case, the nest built in the shape of a cylindrical tube which resembles an organ pipe or a pan flute indicates that an organ-pipe mud dauber lives within. Organ pipe mud daubers are long, slender wasps. They build their very distinctive tubes on vertical or horizontal faces of walls, cliffs, bridges, overhangs and shelter caves or other structures. Preferring to occupy the same sites year after year, they create a large numbers of nests. These nests can last many years in protected locations and are often used as nest sites by other kinds of wasps and bees, as well as other types of insects. As predators, these wasps generally provision their nests with various kinds of orb weaving spiders, but their diets include other kinds of spiders, as well. The females not only build the nests, but also they hunt to provision them. However, organ pipe mud dauber males have reportedly brought spiders to the nest, and they aid in nest guarding. Being a predator still has its threats. A variety of parasitic wasps, ranging from extremely tiny chalcidoid wasps to larger, bright green chrysidid wasps attack mud dauber nests. They pirate provisions and offspring as food for their own offspring. Since mud daubers don't usually attack humans, you should think twice before removing these spider-killers from your home. Learn more.